Background Polypharmacy can decrease medication adherence and increase the incidence of adverse drug reactions and drug–drug interactions, resulting in falls, hospitalisations and other complications especially in the elderly. Medication-related problems of polypharmacy can be prevented through patient-centred medication reviews but research in this area has been completed largely without examining patients’ viewpoints. Objective The aim was to investigate patient views about a clinical pharmacist-led patient-centred polypharmacy medication review service completed within 17 English GP practices with those ≥ 75 years of age and prescribed ≥ 15 medications, during 415 consultations. Method A patient feedback questionnaire was constructed and face validated with two pharmacists then posted by a Clinical Commissioning Group pharmacist to all patients who had taken part in the service. Data from returned questionnaires were analysed using descriptive statistics and qualitative patient comments were analysed using thematic analysis. Results Of the 166 patients (40% response rate) who returned a feedback questionnaire 83% found the service helpful. Medication-related concerns of 94% who had a concern beforehand were addressed, and 80% understood their medicines better after the review. Patients appreciated pharmacists’ personal approach, advice and explanation. Conclusion Patients expressed broadly positive views about polypharmacy reviews by clinical pharmacists within GP practices. We would like to thank the following colleagues for contributing to the clinics: Dawn Best, Melody Chapman, and Sally Clarke, all Prescribing Support Pharmacists based at Windsor, Ascot & Maidenhead CCG. Duerden M, Avery T, Payne R. Polypharmacy and medicines optimisation making it safe and sound. Kings Fund [Internet]. 2013 [cited 2017 Aug 17];1–68. https://www.kingsfund.org.uk/publications/polypharmacy-and-medicines-optimisation. Maher RL, Hanlon J, Hajjar ER. Clinical consequences of polypharmacy in elderly. Expert Opin Drug Saf [Internet]. 2014 [cited 2017 Aug 17];13(1):57–65. http://www.ncbi.nlm.nih.gov/pubmed/24073682. Patterson SM, Cadogan CA, Kerse N, Cardwell CR, Bradley MC, Ryan C, et al. Interventions to improve the appropriate use of polypharmacy for older people. Patterson SM, editor. Cochrane database Syst Rev [Internet]. 2014 [cited 2017 Aug 17];10(5):CD008165. http://www.ncbi.nlm.nih.gov/pubmed/22592727. Petty DR, Knapp P, Raynor DK, House AO. Patients’ views of a pharmacist-run medication review clinic in general practice. Br J Gen Pract [Internet]. 2003 [cited 2017 Aug 17];53(493):607–13. http://www.ncbi.nlm.nih.gov/pubmed/14601336. Reeve E, Wiese MD, Hendrix I, Roberts MS, Shakib S. People’s attitudes, beliefs, and experiences regarding polypharmacy and willingness to deprescribe. J Am Geriatr Soc [Internet]. 2013 [cited 2017 Aug 17];61(9):1508–14. http://www.ncbi.nlm.nih.gov/pubmed/24028356. Anthierens S, Tansens A, Petrovic M, Christiaens T. Qualitative insights into general practitioners views on polypharmacy. BMC Fam Pract [Internet]. 2010 [cited 2017 Aug 17];65(11):1–6. http://www.ncbi.nlm.nih.gov/pubmed/20840795. NHS England. 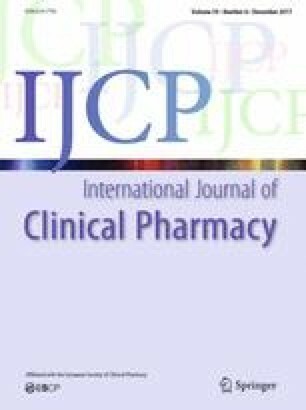 Clinical pharmacists in general practice pilot. 2015 [cited 2017 Aug 17]. https://www.england.nhs.uk/gp/gpfv/workforce/building-the-general-practice-workforce/cp-gp/#. PrescQIPPP. Polypharmacy and deprescribing webkit [Internet]. 2017 [cited 2017 Aug 17]. https://www.prescqipp.info/polypharmacy-deprescribing-webkit. Braun V, Clarke V. Using thematic analysis in psychology. Qual Res Psychol [Internet]. 2006 [cited 2017 Aug 17];3(2):77–101. http://www.tandfonline.com/doi/abs/10.1191/1478088706qp063oa. Cavendish W, Ridge K. Comunity pharmacy in 2016/17 and beyond [Internet]. Vol. 165, PSNC letter. 2015 [cited 2017 Aug 17]. https://www.gov.uk/government/uploads/system/uploads/attachment_data/file/486941/letter-psnc.pdf.